Six months after Microsoft first released Windows 10 1809 to the mainstream, that Windows 10 feature update from last fall finally been deemed as ready for broad deployment. On March 28, Microsoft officials said they would be changing the Windows 10 release information page to note that it was ready for rollout by the vast majority of customers, including businesses. Microsoft finalized the code for Windows 10 1809, also known as the Windows 10 October 2018 Update, in September 2018 and started to roll it out to consumers on October 2, 2018. Shortly after mainstream rollout began, Microsoft had to pull Windows 10 1809 -- and its Server equivalent, Windows Server 2019/1809 -- because of a bug that caused some users to lose their data and encounter issues involving ZIP compressed files. In mid-November 2018, Microsoft re-released Windows 10 1809 and Windows Server 2019, taking a very cautious and slow approach to making them available to mainstream users. Microsoft restarted its support timeline clock, making November 13 as the revised start of servicing date for both the Semi-Annual Channel and Long-Term Servicing Channel for the products. 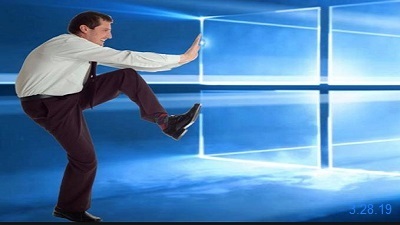 Microsoft officials recently announced that, as of Windows 10 1903, they would be discontinuing the Semi-Annual Channel Targeted (SAC-T) designation which some businesses were using as part of the way they roll out feature updates to Windows 10. Microsoft officials publicly said they dropped SAC-T because they're trying to align the way they talk about Windows 10 and Office 365 servicing. Today in a very short blog post about the broad-deployment status for 1809, Microsoft officials did note that they'd "continue to communicate for future releases the transition from targeted to broad deployment status." Further details posted on OUR FORUM.